The Royal Canadian Mounted Police recently made a decision to reclassify the Swiss Arms PE90 as a prohibited firearm. The Swiss Arms PE90 is the Canadian version of SigSauer's SIG551. The RCMP are in charge of how firearms in Canada are classified. As I understand it, a firearm can be classified as unrestricted, restricted, or prohibited by the RCMP's Canadian Firearms Program. The problem here is that the RCMP had originally classified the Swiss Arms Green Classic PE90 as either unrestricted or restricted depending on barrel length 10 years ago. Since then, Canadians have purchased upwards of 2,000 of these rifles at a cost between $3-4000 each. Now the RCMP is telling the gun owners that they must surrender these rifles to them without any sort of compensation. California Attorney General Kamala Harris released this statement yesterday explaining why she was appealing the 9th Circuit Court of Appeals decision in Peruta v. San Diego. Attorney General Kamala D. Harris today filed a petition in the Ninth Circuit Court of Appeals, on behalf of the State of California, urging the court to review and reverse its decision in Peruta v. County of San Diego. In its February 13, 2014 Peruta decision, the Ninth Circuit ruled that San Diego County violates the Second Amendment by requiring individuals to show “good cause,” beyond a mere desire to carry a gun, when applying for a concealed-carry weapons permit. “Local law enforcement must be able to use their discretion to determine who can carry a concealed weapon," Attorney General Harris said. "I will do everything possible to restore law enforcement's authority to protect public safety, and so today am calling on the court to review and reverse its decision." California state law currently requires individuals to show "good cause" to carry a concealed weapon, but gives local law enforcement control over the permit process. If the Ninth Circuit’s ruling is allowed to take effect, officials throughout the State could be required to issue concealed-carry permits to individuals based on nothing more than the applicant’s assertion that they wish to carry a gun for self-defense. On February 21, 2014 San Diego Sheriff Bill Gore announced he would not seek further review of the Ninth Circuit’s ruling. As I read Harris' statement I was struck by two things which I have highlighted. First, she wants "Only Ones" to be able to say yea or nay to who may have a carry permit. This is the same situation we had until recently in the Jim Crow-era South. In North Carolina, pistol purchase permits are still in the hands of local sheriffs but they now have less discretion to deny a permit. When the law was passed by the NC General Assembly in 1919, the intent was that local sheriff would grant pistol purchase permits to upstanding white men and women while denying that same right to blacks. It was racist then and its racist now. The second thing in Harris' statement that struck me was the horror expressed that California officials would be required to issue carry permits "based on nothing more than the applicant's assertion that they wish to carry a gun for self-defense." Can you imagine the nerve of those ordinary people wanting the same privilege reserved for the high and mighty and/or large donors to sheriffs' election funds? Does not the ordinary citizen have the same right to self-defense of him or herself? California prides itself on being a trendsetter. In this case, it is lagging the nation including states like Illinois where, until late last year, carry was reserved for cops and Chicago aldermen. You just knew that the gun prohibitionists would not take the win in the Peruta decision lying down especially since San Diego Sheriff Bill Gore decided to accept the decision. Today, in what seems to be a coordinated effort, California Attorney General Kamala Harris, the Brady Campaign, the Legal Community Against Violence, the California Peace Officers Association, and the California Police Chiefs Association filed petitions requesting an en banc hearing. The State of California represented by Harris and the Brady Campaign also filed motions to intervene in the case. In an article by Emily Miller this evening, Chuck Michel questioned whether any of these parties have standing. Chuck Michel, the west coast counsel for the National Rifle Association, said Ms. Harris‘ motion to intervene was far out of line because her office wasn’t part of the lawsuit. UPDATE: As to why Kamala Harris et al are trying to get the Peruta decision reviewed and overturned, I think this story from Fox News pretty much gives the reason. Gun owners are flooding the sheriff's offices in two California counties with applications for concealed weapon permits following a bombshell ruling two weeks ago by a federal appeals court that citizens need not justify their requests. Orange and Ventura counties have dropped the "good cause" standard for issuing conceal carry permits after the requirement was struck down Feb. 13 by the U.S. 9th Circuit Court of Appeal. A three-judge panel of the court ruled 2 to 1 that the Second Amendment bars California counties from requiring law-abiding gun owners who want to carry concealed firearms to demonstrate special, individualized needs for protection. More than 500 applications have poured in to the Orange County Sheriff’s Department in just two weeks — roughly the total number of applications filed in 2013, a spokesman said. Orange County Sheriff Sandra Hutchens announced on the department's website that the county will comply with the federal court's order immediately, sparking the wave of applications. Once the proles get their permits to carry you just can't keep them down anymore. Making the headlines this past weekend was the capture of Sinaloa drug cartel kingpin Joaquin "El Chapo" Guzman by Mexican marines in a joint US-Mexico operation. What caught my eye in the story of how they got Guzman was this little detail. "He had an AK-47 next to the bed. When the Mexican marines entered the condominium, he was still asleep," said Michael Vigil, a former Drug Enforcement Administration official who says he was briefed on the raid. "They used the element of surprise, and he did not have a chance to react and seize his weapon." Guzman had an assault rifle and ammunition close by when Mexican marines broke into the apartment in a "surgical" operation, the Mexican official said. What makes this detail so intriguing is that so many of the AKs "walked" to Mexico during Operation Fast and Furious ended up in Sinaloa Cartel hands. Indeed, the cartel's logistics head who is in US custody, Jesus Vicente Zambada-Niebla, has argued in court filings that the walked guns were meant to arm the Sinaloa Cartel in their fight with their rivals. You have to wonder if that AK-47 was a walked firearm and, if so, will the serial numbers be sent to BATFE for tracing. For some reason, I think while the Justice Department is quite pleased that they "got Shorty", I don't think they will ever want that particular AK-47s serial numbers traced. The answer might not be to their liking. If you are a deer hunter and you have ever used scent products, you know of Tink's #69 Doe-in-Rut deer scent. It is the most famous of products developed by Tink Nathan. Now Mr. Nathan is looking beyond just deer scents and lures to politics. He is a candidate for the Texas House of Representatives running as a Republican. His platform? Roadkill! More specifically, an end to the prohibition in Texas on picking up roadkill for human consumption. 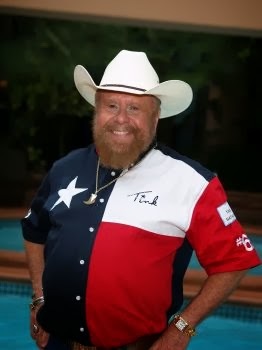 He's also the only candidate, apparently in the entire state, bold enough stand up and defend Texans' God-given right to eat animals they run over in their cars. Nathan thinks that scavenging roadkill is a personal decision best left up to a driver and the critter he just flattened. There's no need for the government to stick its nose in. Besides, he told the San Antonio Express-News, why should buzzards be the only ones to benefit from the frequent animal-car collisions that occur by the thousands on Texas roads. "That meat goes to waste," Nathan says. "Why not utilize it?" I think he might have a point. In other states it is legal and oft times fresh (emphasis on fresh) roadkill is taken to charitable food pantries for distribution. Besides, I like his campaign slogan - "Don't Send Another Lawyer To Austin" - not to mention the fact he is a Life Member of the NRA. What is considered normal and lawful in most of the rest of the country is illegal in New York City. Knicks guard (and former UNC Tar Heels star) Raymond Felton unfortunately found this out the hard way. Felton was arrested this morning on two felony counts of possession of an unregistered firearm. The firearms were taken to a local police precinct house by an attorney for his wife Ariane Raymondo-Felton. But before the Monday night game, an attorney for wife Ariane Raymondo-Felton arrived at a Manhattan police precinct with a Belgian-made FN Herstal pistol, police spokesman Sgt. Lee Jones said. Ramondo-Felton later went to the precinct that night and made a statement to detectives, police said. Investigators then contacted the director of security at Madison Square Garden in an attempt to reach Felton, police said. Felton made no statement after he arrived at the precinct with a lawyer, police said. He was charged with second- and third-degree criminal possession of a firearm, which are felonies, and fourth-degree possession of a firearm, a misdemeanor, a police spokesman told ESPNNewYork.com. Police said Felton was in possession of a gun he wasn't registered to own. Felton is expected to appear in criminal court in Manhattan later Tuesday. Raymondo-Felton is a law student at Fordham University School of Law, a spokeswoman confirmed. Court records show she filed for divorce from Felton on Feb. 18. Felton, a South Carolina native, started his NBA career playing for the Charlotte Bobcats. Given the hell that New York Police are going to put him through, I'll bet he wishes he still was in Charlotte. The Tennessee Law Review will be hosting a symposium on the Second Amendment this Saturday in Knoxville. The symposium will feature a number of Second Amendment scholars including Glenn Reynolds, Stephen Halbrook, and David Kopel. It will have three panels discussing state regulation, the Second Amendment in the "academy", and the reach of the Second Amendment after Heller and McDonald. The symposium will take place at the UT School of Law located at 1505 W. Cumberland Avenue in Knoxville. Free parking is available in the White Avenue parking lot. Entrance to the law school is from White Avenue. The Tennessee Law Review will be publishing the papers presented in an upcoming issue of the Tennessee Law Review (81:3 Spring 2014). The cost for this issue will be $10 plus postage and can be ordered from TLR. If you live within driving distance, this sounds like a good way to spend a Saturday morning if you have an interest in Second Amendment scholarship. Oh, and did I mention that this symposium is free? Knoxville is right at a two hour drive for me and I'm going to do my damnedest to be there. This week was a good example of work interfering with blogging time. I had a two day out of town conference that was mandatory to attend and it was a very full two days. So I am now just catching up on the blog. I've bookmarked a number of things and will make this a tab-clearing of sorts. The biggest news of the week is that San Diego Sheriff Bill Gore will not seek an en banc review of the ruling of the 9th Circuit in Peruta v. County of San Diego. Dave Kopel notes here that one of the judges on the 9th Circuit could still request a vote on an en banc review sua sponte. It should be noted that there are two cases still pending in the 9th Circuit in which the oral arguments were made at the same time as the Peruta case. They are Baker v. Kealoha et al from Hawaii and the CalGuns/SAF case Richards v. Prieto. Then there is the new (maybe) stamp from the US Postal Service honoring actor, activist, and NRA President Charlton Heston. Now it seems, that the USPS is denying that they definitely are going to have a Heston stamp, that it was just a suggestion, and that they will take into account opposition from the gun prohibitionists. Bitter rightly calls them out on their outright lies pointing out previous memos and announcements. Speaking of gun prohibitionists, Bob Owens applies a well-deserved fisking to that Demanding Mommy (and formerly well-paid Democratic PR flack) Shannon Watts. I think calling her the Carrie Nation of the Gun Prohibitionists is spot-on. On Wednesday, the Washington Times had a feature length article on the case of Lane v. Holder. The plaintiffs have appealed the decision of the 4th Circuit which dismissed the case for a lack of standing to the Supreme Court. The plaintiffs are petitioning for a writ of certiorari in the case. The article features one of the plaintiffs, Amanda Welling, and her challenge to the Gun Control Act of 1968 which prohibits residents of one state from purchasing a handgun in another and then taking delivery of it in the purchase state. Currently, while you can buy a handgun from an out of state vendor, it must be delivered to an in-state FFL who then completes the transfer. In a blow to the anti's argument that guns cause crime, the FBI released a report this past week which showed that crime actually went down as the sales of firearms went up. It is even more interesting to note that in the areas with the highest firearms ownership - the MidWest and South - crime went down even more than in areas with less firearms ownership - the NorthEast. Go figure. However, as Jason Riley at the Wall Street Journal notes, "Not that gun-control zealots, who are so certain of a causal link between firearms and violent crime rates, care about such details." When it comes to firearms, state laws are often stricter than Federal laws. This is most evident in what firearms and accessories citizens of a state are allowed to possess, e.g, mag restrictions in New York, etc. However, these state laws may include disqualifying events that preclude a person from legally purchasing a firearm which are stricter than Federal law. Attorney Paloma Capanna has an interesting article up on these state prohibitors and their roll in NICS check denials. The fallout in New York from the decision of Remington Outdoor Company to expand to Huntsville, Alabama continues. Gov. Andrew Cuomo is in denial about the roll of the NY SAFE Act in Remington's decision saying it was for "purely business reasons". Other analyses say that the SAFE Act is one of the major reasons that Remington looked South. Attorney Chuck Michel takes apart a study purporting to show that policies designed to reduce the number of firearms in the home, especially handguns, were instrumental in reducing the number of childhood gunshot wounds. The funny thing is that injuries and deaths involving children have declined as the number of firearms in circulation has increased dramatically. The old saw about lies, damned lies, and statistics would seem to be the case here especially since Chuck notes the author uses "non-traditional" data sources. I will be the first to admit I don't know much about the inner workings of unions. I was born and bred in North Carolina which is both a right-to-work state and the least unionized state in the nation. While I have and have had relatives who were union members in the North, I've never worked in a job that lent itself to unionization. Yesterday I received a very perceptive and enlightening email regarding Remington, jobs, and unions. The person who sent it to me is very well versed in the inner workings of unions but prefers no attribution and to remain anonymous. The first point he made is that Remington Outdoor Company will say nothing about moving jobs from Ilion to Huntsville for a couple of reasons. First, anything that Remington says that could be interpreted as coercion or related to bargaining would likely lead to serious charges brought by the National Labor Relations Board. The second reason is that Remington's contract with UMW Local 717 could very well contain language or clauses that would lead to automatic unionization of the Huntsville facility. This is referred to as successor language. The second point he made is that without successor language, it doesn't look good for union representation in the South especially given the loss at the Volkswagen plant in Chattanooga. Interestingly enough, Alabama has the highest unionization rate of any Southern state. Remington has a large operation in Ilion and it won't be easy to move. But given time, you will start to see operations begin to move South. It is my understanding that R&D is already slated to move to Huntsville. The city, by the way, is also home to the Redstone Arsenal which has as one of its component organizations that Army Material Command as well as a number of Ordnance Corps units. If the Republicans take control of the US Senate, Sen. Jeff Sessions (R-AL) is the 3rd ranking Republican on the Senate Armed Services Committee and could easily get the ear of the DoD for Remington. I was able to look at an earlier collective bargaining agreement between Local 717 and Remington. While I did not find successor language in it, I did see language that mandated certain models produced by Remington must be made in Ilion. Article II- Scope and Coverage, Section g - Job Security says that products such as the Remington Model 7, 700, 7400, and 7600 rifles and the Remington Model 870, 1100, and 1187 shotguns "will continued to be produced only at the Ilion plant". It did allow for Remington to procure component parts elsewhere. This contract expired in 2007 and I can't imagine succeeding contracts not containing similar language. The new pact includes a provision extending Local 717 jurisdiction to any new plant that Remington builds, as the company is presently considering, within a 100-mile radius of the main plant in Ilion, N.Y. In addition to a $500 signing bonus, the contract features 3 percent wage increases in each of the first four years, and 3.5 percent in the final year. It also maintains the current level of medical benefits, improves the language governing overtime and creates a new position, Utility Specialist, aimed at reducing the reassignment of regular workers. This contract was ratified two days before the shootings in Newtown, Connecticut. They could not have imagined the NY SAFE Act when the collective bargaining agreement was ratified. If this contract contained the same earlier language as to what models would be produced at the Ilion plant, you have to wonder if it extended to the Bushmaster AR-15s whose production had been shifted from Windham, Maine to Ilion. It is hard to conceive that a company would want to take the chance of producing a firearm in a state where it couldn't be sold. To sum it all up, while Remington's current contract with Local 717 may preclude the rapid transfer of existing production lines from Ilion to Huntsville, production will start shifting South over time. Remington, the Governor's Office, and the local governments involved sent out a joint press release yesterday announcing the expansion of Remington Outdoor Company in Huntsville, Alabama. HUNTSVILLE AND MONTGOMERY, AL — Governor Robert Bentley on Monday announced Alabama has recruited the country’s oldest firearms manufacturer to Alabama. Remington Outdoor Company (ROC) will expand to the old Chrysler building in Huntsville, and create more than 2,000 new jobs within the next ten years. Governor Bentley joined Remington Chairman and CEO George Kollitides and other state and local leaders for the official announcement. “I am honored to welcome Remington to Alabama,” Governor Robert Bentley said. ROC has 19 locations in the United States, and Huntsville and Madison County officials praised the company’s decision to expand to Huntsville. Following facility upgrades, ROC is expected to begin operations in Alabama within the next 18 months. Cuomo Spokesman: "No Remington Jobs Are Leaving NY"
Rich Azzopardi, who some describe as "Ewok-like", has been the spokesman for Gov. Andrew Cuomo (D-NY) since 2012. Yesterday he went on Twitter to try and deflect from some of the attention the Remington expansion in Alabama is getting. In the strictest sense of the word, New York may not be losing any jobs - for now. In the short-term, it will take some time before Huntsville is up and running. However, as the production lines begin to come online in Huntsville and the cost per unit of production starts to decrease compared to Ilion, just how long do you realistically think Remington Outdoor Company will wait before shifting production lines south? The Ilion, New York plant will become for Remington what the East Alton, Illinois plant has become for Winchester: an aging albatross of a building with a highly unionized workforce in a state whose politics is dominated by the gun prohibitionists. While you may leave some production there because of specialty machines and craftsmen, the bulk of it is eventually going to shift to the newer plant. The CalGuns Foundation has calculated that the number of carry licenses in California could reach as high as 1.4 million if the Peruta decision stands and California goes "shall issue". Following the Ninth Circuit decision holding "good cause" requirements unconstitutional, The Calguns Foundation projects that the number of California carry licensees will skyrocket during the first year of effective "shall-issue" licensing. According to data sent to The Calguns Foundation by the California Department of Justice, the number of California CCW licensees in 2013 totaled about 56,000. However, in applying projections to state and county population figures from the state's Department of Finance, Calguns believes that the number of licensees in California might reach as high as 1.4 million in the Golden State during the first year of a "shall issue" system. They have calculated the growth of carry licenses on a county-by-county basis which can be seen here. Their table provides estimates for a range from one to five percent of a county's population with the expectation that two percent will be the most likely. CalGuns has used available census statistics, California Department of Justice statistics on both carry licenses and firearms purchases, and the experience of other states to make this projections. Looking this over, it is is interesting to look at the table to see what might transpire in some of the more anti-gun counties. For instance, San Franciso County might grow from two carry permits to an estimated 12,707 at the 2% level. While San Francisco is the most extreme example, many other counties could see multiple 1,000% increases such as LA which could see an 88,000% increase in carry permits at the 2% level. You have to wonder if the state's anti-gun politicians might moderate their extremism if they suddenly found a good number of their constituents had carry licenses. It is easy to demonize a group of people when you only have a few examples like the two who have carry licenses in San Francisco County. It is much harder to do if you have substantial numbers and everyone knows someone with a carry license. The first official confirmation that Remington plans to expand to Huntsville, Alabama comes from Sen. Jeff Sessions (R-AL). Prior to this, all reports have had to say that "an announcement is expected" because "high level sources" "have confirmed it". I sincerely doubt a senator would make such a release unless it was a done deal. "Remington's decision is great news and a further testament to the world class workforce in Huntsville. This plant will create good-paying manufacturing jobs for thousands of workers. We warmly welcome Remington Arms and look forward to their success and presence for years to come." While Gov. Robert Bentley (R-AL) did allude to it when asked, all he said was "I think Monday you'll see something very special in the state." That is a lot more nebulous than Sessions' comment. The backers of the New York SAFE Act said the law would make New Yorkers safer. About the only thing I can see that it has done is to cost good, hard working New Yorkers their jobs. This view is shared by Fran Madore, President of United Mine Workers Local 717. The union represents the overwhelming majority of the workers at Remington's Ilion, New York plant. A union official said Saturday the Remington Arms Co.'s decision to open a manufacturing plant in Alabama does not bode well for Ilion, and he's blaming New York's SAFE Act restrictions on assault weapons. "It can't be good," said Fran Madore, president of United Mine Workers Local 717, which represents 1,180 of the 1,300 Remington employees in Ilion. "How can it be good?" Madore said plant officials told him they wanted to meet with him Monday. They did not say what they wanted to talk about, but Madore said he assumes it will be about the company's reported plans to open a 500,000-square-foot manufacturing plant in Huntsville, Ala. In his interview with the Syracuse Post-Standard, Madore goes on to say that the NY SAFE Act crippled them and that he is worried that jobs will lost in Ilion. I think Mr. Madore has good reason to be worried. Rob Curtis at the Military Times' GearScout blog is reporting this afternoon that Remington Outdoor Company aka Freedom Group will be building a new plant in Huntsville, Alabama. This new plant is reported to be equivalent in production capacity to their Ilion, NY plant. However, this new plant will supplement but not replace the Ilion plant. Remington Outdoor Co., previously known as the Freedom Group, expects to announce a major expansion to a new facility in Huntsville, Ala., as early as next week. According to two sources with knowledge of the property sale, the deal has been in the works for months and ROC executives plan to sign the papers Monday finalizing the sale of a 500,000-square-foot facility that will add approximately 25 percent more space to Remington’s existing 2.1 million square feet of existing manufacturing real estate. Sources say the expansion was undertaken to help the company meet unprecedented demand for its products. Space in the facility is not currently earmarked for any one of the company’s 18 individual brands, but to facilitate flexibility and growth of the Remington Outdoor Company. Before settling on Hunstville, the company was courted by no less than 24 states and various localities hoping to add hundreds of new jobs to their economies. State and local entities in Alabama made economic concessions to attract the company, sources say. The selection of the Huntsville area makes sense, with a skilled and technical workforce already in place. The area is home to the Army’s Redstone Arsenal, which has 35,000 military and civilian employees. Other major technical employers in the area, such as NASA’s Marshall Space Flight Center, and Toyota, ensure ROC will have a large pool of talent to draw upon for its engineering, technical manufacturing and product development efforts. The fact that Alabama is regarded as a strong supporter of Second Amendment rights also played a role in the selection of the area. More on this move by Remington at the GearScout blog found here. UPDATE: According to the Alabama-oriented website and blog Yellowhammer, the announcement will be made on Monday about the move by Alabama Gov. Robert Bentley (R-AL). High level sources have informed Yellowhammer News that Remington, one of the world’s largest gun manufacturers, will on Monday join Alabama Gov. Robert Bentley in announcing that they are bringing over 2,000 jobs to Alabama. The company is viewing the move into Alabama as an expansion, but it will likely impact their Ilion, NY plant as well. The New York facility currently employees around 1,200 people. It is expected to stay open, but with a reduced workforce. The initial estimated impact on Alabama’s economy will be roughly $87 million. We just beat the hell outta you! H/T Bitter on the Yellowhammer story. UPDATE II: Phil White, in comments to a post regarding the probable move to Huntsville, says that Remington will occupy the former Chrysler Acustar/Siemens/Continental plant adjacent to the Huntsville International Airport. The property has a 570,000 sq. ft. manufacturing facility and a 200,000+ sq. ft. research facility. The video below is a sales promo for the property. It looks like Remington is getting a facility upon which they can build a future unlike their Ilion, NY plant. The CalGuns Foundation released a statement yesterday evening on the win in the 9th Circuit yesterday. They congratulated the NRA, the California Rifle and Pistol Association, attorney Paul Clement, and California gun law firm Michel & Associates for their work that led to this win for Ed Peruta and the other plaintiffs. If the NRA hadn't stepped in when they did, this could have turned into a terrible loss for the Second Amendment in California. The CalGuns statement does give a little bit of the back story on this case. In a major decision today, the federal Ninth Circuit Court of Appeals held that California’s “good cause” requirement for handgun carry licenses violates the Second Amendment to the United States Constitution. In May 2009, during a short period when the federal Second Amendment legally applied to California through the Ninth Circuit’s Nordyke v. King decision, civil rights attorneys Alan Gura and Donald Kilmer filed a federal right-to-carry lawsuit against Sacramento County’s then-sheriff John McGinness and Yolo County Sheriff Ed Prieto on behalf of The Calguns Foundation (CGF), the Second Amendment Foundation (SAF), and a number of individual plaintiffs. That lawsuit, then named Sykes v. McGinness, challenged the California statutes requiring “good cause” and “good moral character” as facially unconstitutional. The Sykes case also challenged the two sheriffs’ local policies as unconstitutional “as-applied” to the individual plaintiffs’ facts. Sacramento County eventually settled out of the lawsuit by agreeing to implement a “shall-issue” policy; the case continued against Yolo County and Yolo County Sheriff Ed Prieto as Richards v. Prieto. Months after the Sykes case was filed, a lawsuit that replicated the CGF/SAF lawsuit was filed in San Diego County by Mr. Edward Peruta. 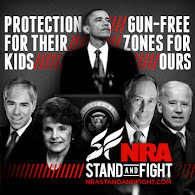 Thankfully, the National Rifle Association intervened in the Peruta matter, adding new plaintiffs and significant resources to the case’s legal team including noted civil rights law firm Michel & Associates as well as former Solicitor General Paul Clement. The Peruta case result today is due in large part to the strength of the arguments mirrored from the Sykes lawsuit as well as the excellent legal work by Michel & Associates and Mr. Clement. Though the Richards and Peruta cases were heard by the same three judge Ninth Circuit panel on the same day, the Court has only released its opinion on the Peruta matter so far. We look forward to the Court’s Richards decision and continuing our efforts to ensure that all law-abiding Californians have an accessible way to fully exercise their right to bear arms for self-defense. The Calguns Foundation thanks the National Rifle Association, California Rifle & Pistol Association, Michel & Associates, and Mr. Paul Clement for their fantastic work to advance the fundamental Second Amendment right to keep and bear arms and congratulates them on their very important victory for all law-abiding Californians. For more on these cases and the legal status of the right to bear arms (carry) in California, please visit http://www.calgunsfoundation.org/carry. When Biathlon Rifles Really Could Be Used For "Military Patrol"
Long before biathlon competitors used .22 rifles with exotic stocks made by Anschutz or Izhmash and with bolt assemblies reminiscent of Formula One shifters, there were Mausers, Mosin-Nagants, and Winchester Model 70s. Indeed the first Olympic biathlon held in 1924 in Chamonix, France was called "military patrol". Olympic biathlon competition as a medal sport would return until the 1960 Squaw Valley Olympic Games. The competitors in these games would also use bolt action rifles in center-fire calibers. They would fire 20 shots - 5 each at 200m, 250m, 150m, and 100m - with the first three series being fired prone with the last series being fired standing. Indeed, it wasn't until 1978 that the governing body changed the course of fire to 50m with a .22 LR rifle. The 1980 Lake Placid Olympics were the first to feature the new rules. So it should not be surprising that many of the biathlon rifles from the earlier era were derived from the standard military rifles of the various countries. 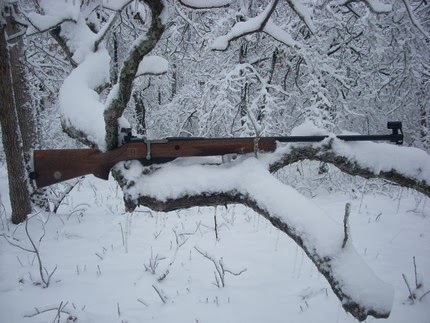 Given the history of winter warfare and ski troops in Scandinavia and the former Soviet Union these rifles are concentrated in those countries. The American competitors, by contrast, are reported to have used the Winchester Model 70 in .243 Winchester and .308 Winchester. The Swedes developed the CG-62 biathlon rifle from their Mausers in 6.5x55. The CG, of course, stands for Carl Gustav which was the primary manufacturer of the Swedish Army's rifles. 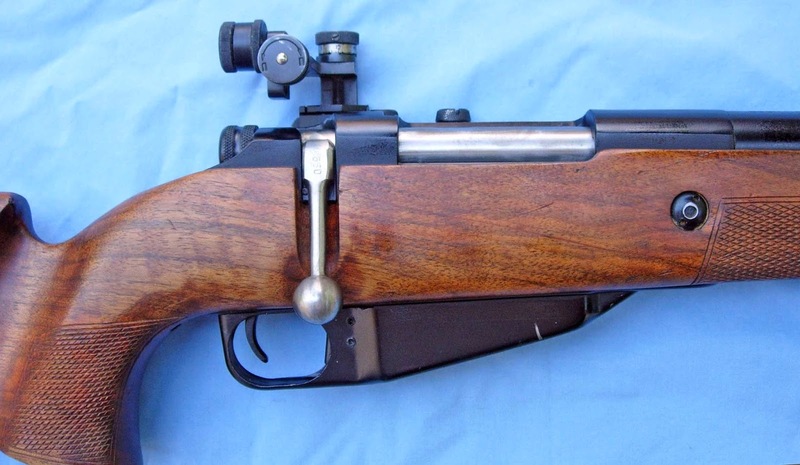 Before this rifle they used cut down and modified M96 Mausers. Examples of the CG-62 are shown below with the bottom picture being a variant of the AG-42 Ljungmann turned into a biathlon rifle. You can read more about the history of these Swedish rifles on these threads. With both Finland and the Soviet Union having tons and tons of Mosin Nagants on hand, it is not surprising that they became the base rifle for their biathlon rifles. The Finns developed the M-N M28-57 for their biathlon rifle. Chambered in the usual 7.62x54R cartridge, it appears to be a cut down version of the M28-30 with micrometer sights added. The latter rifle was used extensively by the Civil Guards in rifle competitions. The M28-57 can be seen below. 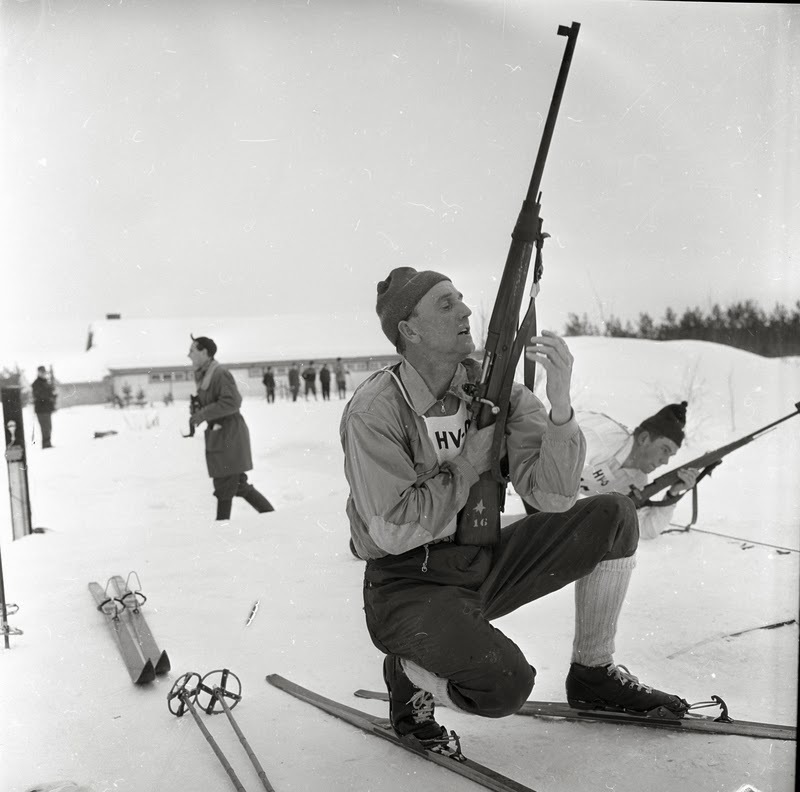 The Finns later adopted a Sako Forester (L579), cut for stripper clips,with a heavy barrel and micrometer sights for biathlon. While I can't find a picture of this rifle, it is my understanding it was chambered in .243 Winchester. 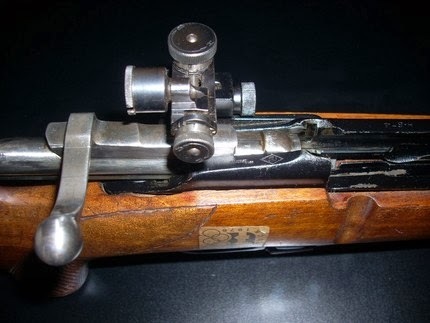 The Soviets took their adaptation of the Mosin Nagant for biathlon competition even a step further by developing a new round for it. While similar to the Finnish rifle, the Soviet Vostok was chambered in both the usual 7.62x54R and the 6.5x54R. The latter is a necked down version of the 7.62x54R. 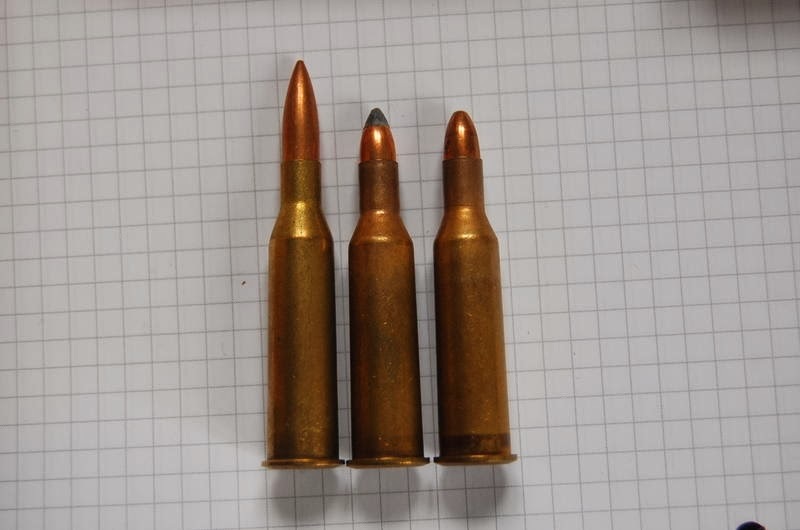 Pictures of the rifle and 6.5x54R cartridge can be seen below. Finally, we have that other Scandinavian biathlon power - Norway. To the best of my knowledge, Norwegian athletes used a modified Mauser M59. The unmodified version can be seen below. These rifles were made by Kongsberg Våpenhistoriske Forening (Kongsberg Small Arms Factory). According to their website, they made a limited number of these just for biathletes. While the M59 was originally chambered in .30-06, later versions were chambered in both 7.62x51 and 6.5x55. It would be my guess that the biathlon team used the 6.5x55 round. 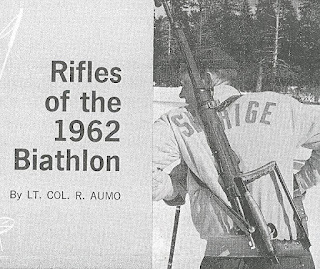 Another view of the rifles used can be seen in this picture from the 1962 Norwegian Biathlon championships. It definitely looks similar to the M59 above. The Digitalt Museum has a whole series of photos from that event here. Germany, both East and West, were solid competitors in biathlon. Unfortunately, the only thing I can find is a stamp from the DDR (East German) showing a biathlete shooting. Other than being a bolt action rifle with target sights, who knows. I wouldn't be surprised if they used the Vostok or Mosin Nagant variant used by the Soviets. I am sure that there may be other purpose-built center-fire biathlon rifles out there but I think I've covered quite a few of them. The NRA-ILA released this on the decision released today in Peruta v. San Diego saying that "good cause" cannot be used as a criterion for issuance of a carry permit. The case was argued in the 9th Circuit by former Solicitor General Paul Clement. Fairfax, VA – The United States Court of Appeals for the 9th Circuit today ruled in favor of the right of law-abiding citizens in California to carry a firearm outside the home for self-defense. California law allows local governments to issue concealed and open carry permits, but generally prohibits the carriage of handguns in public places. The San Diego County Sheriff’s office further restricts gun permits only to law-abiding citizens who can prove “good cause,” meaning they have to show they faced a specific threat to their safety above what the general public faces. The court ruled San Diego County’s gun regulation scheme unconstitutional. Under the ruling, law-abiding citizens in California would be allowed to carry a handgun for self-defense in public places, not just in their homes. In addition to supporting the case financially from the beginning, the National Rifle Association filed a friend of the court brief in support of the plaintiffs. “No one should have to wait until they are assaulted before they are allowed to exercise their fundamental right of self-defense,” said Chris W. Cox, Executive Director of the NRA’s Institute for Legislative Action. “The U.S. Supreme Court has already affirmed our Constitutional right to Keep Arms, and today, the 9th Circuit Court of Appeals affirmed the right to Bear Arms. Our fundamental, individual Right to Keep and Bear Arms is not limited to the home,” concluded Cox. Are You A Prepper In The St. Louis Area? If you are a prepper or suburban homesteader in the St. Louis metro area and are in the market for a new home, I'd like to point out a real estate auction that will be taking place on Thursday, February 20th in O'Fallon, Illinois. The auction is part of a mega auction handled by Adam's Auctions of Belleville, Illinois. The auction flyer can be found here. There is an open house this coming Sunday, February 16th from 12 to 2pm. The house is located at 970 Old Vincennes Trail in O'Fallon. The house and land belong to the Complementary Spouse's mother who now resides in senior-living apartment. At age 84, it was just too much for her to keep up with. The property consists of a 3 bedroom, 3 full bath brick ranch with a full, finished walk-out basement. It has fireplaces with inserts on both levels. The house is listed as being 4,832 square feet of heated living space. More details on the house are available here. A virtual tour of the house is available here. It is situated on 5 acres of partially wooded land on the outskirts of O'Fallon, Illinois. It also has a heated two story outbuilding that has a shop and a two car garage. There is also an old barn at the back of the property which could be torn down or refurbished. At the very least, you could sell the barn wood for decorative uses like picture frames. Front view of house - picture taken this past Christmas. The house is surrounded by many farms yet is just around the corner from O'Fallon police department and about a mile from the fire department. A very modern YMCA is in walking distance from the back of the property. It is also about 3.5 miles to the front gate at Scott Air Force Base. Scott is the home to the US Transportation Command, Air Mobility Command, and the Surface Deployment and Distribution Command. A small stream runs through the property and the property still has a functioning well though it is on city water. In other words, from a prepping standpoint, you have an alternate source of water. The house is heated with propane and there is a large tank. However, you do have the option of connecting to natural gas as a gas line was run on the property after it was built. When the Complementary Spouse's parents bought this property in 1999, it was supposed to be their dream retirement home. Her mom had a sewing room and lots of space for storage. Her father had his workshop out back, space for a large garden, a private office, and a locked gun room. The house could hold all their three children and all their eight grandchildren comfortably at the holidays. Cancer interrupted those dreams as it is wont to do. I have spent many a Christmas and summer vacation in this house. I love this house. If I could teleport the house and property to North Carolina, I'd do it in a heart beat. While not perfect, it has all the raw material needed for a suburban homestead - land, trees, water, and space. If you are interested and have questions, please feel free to pop me an email. Great news out of the 9th Circuit Court of Appeals. In the case of Peruta v. San Diego, the court found that requiring "good cause" to get a carry permit violates the Second Amendment. The court said the state of California can decide what training and background checks are required as well as the manner of carry. However, they can't preclude the vast majority of Californians from exercising their right to carry. Dave Kopel has more here at the Volokh Conspiracy page of the Washington Post. Here is some background on the original case, the decision by District Court Judge Irma Gonzalez, and the decision to appeal the case to the 9th Circuit. The case was appealed to the 9th Circuit in late 2010 which shows just how long it takes to move Second Amendment cases forward. I stumbled across this on Tumblr and all I can say is...I want it! Now if I could only have a pair of these with snowshoes grafted on to them, it would be perfect given the 8" of snow on the ground here in western NC. 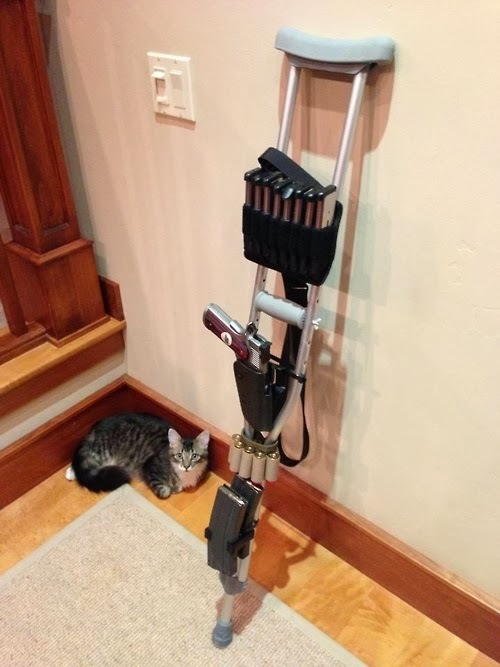 I'm thinking the connection between the crutch and snowshoes would need some sort of articulated joint with hydraulic dampening. Oh, the things you dream about when you are stuck in the house due to snow and a broken ankle and are starting to get cabin fever.